What is PLA (poly lactic acid) and why we DON’T use bio-plastics like PLA in Bioglitter®? PLA is a thermoplastic polyester bio-polymer. It is produced by the chemical conversion of corn into dextrose, the dextrose is then fermented to lactic acid, which is then polymerised into polylactic acid, PLA for short. Bio-plastics such as PLA WILL NOT biodegrade in the natural environment, they need the man-made conditions (elevated temperatures and extremely high humidity) found in industrial composting processes. It’s our view that there is a significantly higher probability for glitter to be found in general waste, wastewater, fresh water and in the outdoor environment after use. Therefore, the route to industrial composting via the recycling compost bin, a possible solution for packaging waste, is highly unlikely with glitter due to its physical size and how its used. For these reasons we quickly discounted bio-plastics like PLA very early in the development of Bioglitter® as they are NOT suitable for achieving the naturally biodegradability characteristics, we are looking for in a truly biodegradable glitter. In addition, the new UK microbeads legislation introduced in January 2018 defines any plastic particle less than 5mm as a microplastic and therefore would include any thermoplastic glitter, like a PLA based glitter. PLA is plastic and therefore also NOT suitable for achieving the plastic-free characteristics we are looking for in our Bioglitter® products. Lots of independently documented information can be found on the internet that explains the disappointing realities of PLA’s inability to biodegrade in the natural environment, this link to a UN report offers good insight. 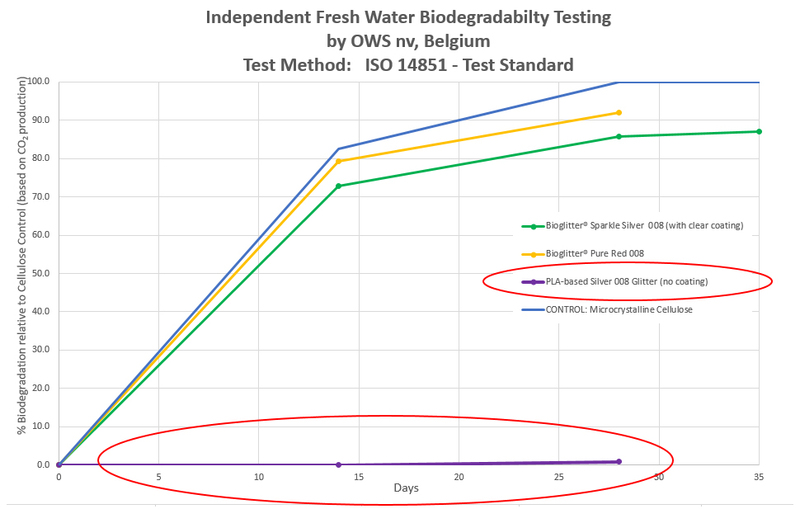 As part of the independent testing of Bioglitter® by OWS to ISO 14851 – Fresh Water Biodegradability. A commercially available PLA silver glitter (with no coating) was also tested alongside Bioglitter® Sparkle Silver (with a clear coating). 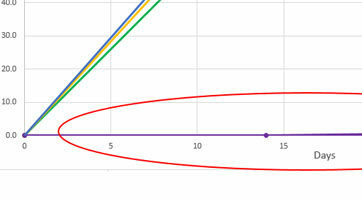 As the graph below clearly illustrates, PLA glitter (purple line on the x axis) does not biodegrade in the natural environment.